Noah and his family are living in The Children’s Hospital because his new sister, Jessica, was born with a serious medical condition. 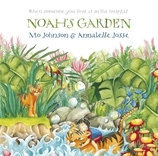 Normal family life is suspended indefinitely for Noah, but in the true spirit of childhood, he spends his days in the hospital garden, creating an imaginary world, longing for the day when Jess can join him. A hospital courtyard garden — and a vivid imagination — are a haven for a young boy as he waits for his baby sister to be well enough to join him. Mo Johnson teaches high school literature and drama and began writing for children in 2005. Born in Glasgow, Scotland, she now lives in Sydney, Australia. Annabelle Josse makes her picture book debut with Noah’s Garden. She was born in France and now lives in Australia.